Louisville Stoneware : The richness of raw materials. The perfection of a basic form. The poetry of a hand-applied brush stroke. In our machine-driven age, these natural and simple essences seem to have become a lost art. Since our early beginnings, we have been dedicated to the craft of transforming clay into enduring, functional art forms. Working with the basic elements of earth, water, air and fire, skilled artisans create timelessly beautiful dinnerware, bakeware, serving pieces and collectibles that can be enjoyed and cherished for many generations. Some designs are subtle—others are more striking and exuberant—but what they all have in common is an underlying belief that humble, everyday objects have an important place in our lives and homes. did you know Natural stoneware clay is rendered timeless by no fewer than 20 pairs of hands.The clay, which may be as old as 250 million years, is excavated from deposits in western Indiana. That is amazing. I am holding history in the palm of my hands. A blunging tank mixes batches of raw clay with water to break up the material and remove impurities. A fine sieve filters pebbles, twigs and other coarse materials from the wet clay mixture. Excess water and any remaining particles are removed by a filter press, making the clay pure enough for forming and firing. More water is added to the clay to create different modeling consistencies.Slabs of clay are pugged, or kneaded, to create a stiff consistency suitable for molding. Other slabs are inserted in slip tanks, where water is added to convert clay into a liquid mixture that works well for casting. Molds are coated with liquid slip clay to create a smooth canvas for decorating. Plates, bowls and other concentric-shape products are formed through a "jiggering" action, which helps artisans create a consistent thickness. For sculptural pieces with unusual shapes, original plaster molds are created and filled with the liquid slip mixture. As the porous plaster absorbs water from the slip, a clay shell begins to form inside. When the desired thickness is achieved, excess slip is poured out of the mold. Handles are slip-cast separately and applied to mugs and pitchers by skilled artisans while the clay is still soft and malleable. Each newly formed piece is left to dry on racks until it is hard to the touch. At this point, it is called "greenware." Greenware is gently and carefully damp-sponged and trimmed to remove any remaining surface imperfections. Each greenware piece is individually stamped with the Louisville Stoneware logo, a distinguishing mark of originality and authenticity. In early 2007, the stamp applied to pieces will change to mirror our new logo, which is shown in the upper left-hand corner of this page. Surface designs and artist signatures are applied by brush with dull, opaque surface glazes, most of which are made entirely from clay in our studio. From experience, the artist knows the final color the glazes will attain upon firing. 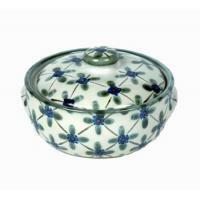 An overglaze is added to hand-painted pieces to give them another layer of durability. 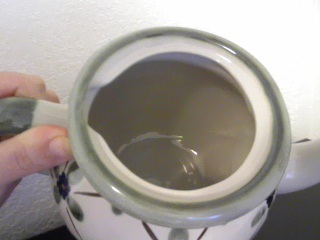 When fired, the glaze gives off a rich luster. Finished pieces are strategically hand-placed onto shelves inside a kiln. When the kiln temperature reaches 1,300°F, the ware begins to glow cherry red, then orange. At a maximum 2,350°F, the glaze melts, forming a glassy surface that's virtually impervious to cracking and chipping—even after years of use. 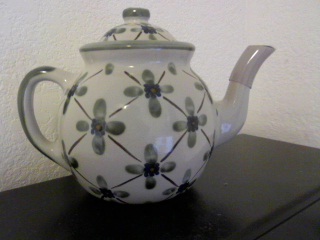 Emily at Louisville Stoneware was sweet enough to send me a Tea pot to review..Let me just say that I Love this teapot! Not only is it nicely made, but it's beautiful! Every little girl has had or has a pretend teapot set, Where you sit your stuffed teddy bears in your little wood chairs and have a table set to have a tea-party, I was one of those little girls. I loved playing pretend tea party, But only i actually filled my plastic tea pot with tea! Let's just say at the end of the day my mom had a huge mess to clean up. This teapot is hand made, and hand painted. Most products made anymore is all or mostly machine made. I'm a old fashioned girl and like value and originality. Louisville Stoneware has done that and beyond. I have never seen such a beautiful made teapot. It's sturdy but yet elegant. This teapot will hold alot of tea! It's rounded and deep shape will have plenty to go around! 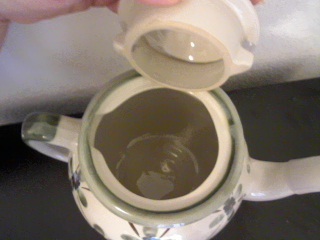 The spout of the teapot has a thick plastic band around it so it will not chip or break, or chip or break the precious little teacups when pouring. This is the only teapot I have seen with this concept and I love it! It's matching top has a lock feature seen the picture. The teapot has a notch made into the frame, and the teapot top has 2 prongs that slide into the teapot itself, and when you turn the lid it locks in place so there is no holding the teapot lid on because the lid will lock in place .I love that idea! The handle is wide made so even the smallest OR biggest hands will be able to put their hands into the handle. Each of Louisville Stoneware products are hand stamped with their Louisville Stoneware stamp that Say's ; Louisville Stoneware - Founded 1815 - Kentucky Crafted. 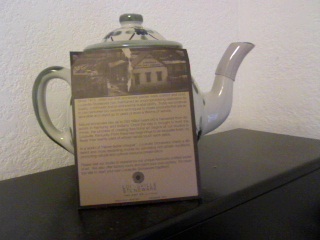 I love seeing crafts such as this teapot with stamps on the bottom because it will be history one day. Maybe even my Great, Great grand kids will own this teapot one day and see the stamp on the bottom and will see the Louisville Stoneware stamp and want to learn more about it. And they will pass it onto their Grandchildren and so on.. A piece of MY history will be a piece of theirs. 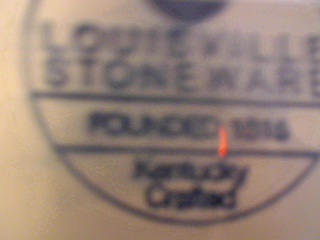 Check out Louisville Stoneware and buy a piece of your history to pass on. Louisville Stoneware. Louisville Stoneware will have something you are sure to like, Such as Teapots, collectibles such as KFC collectibles, platters, mugs, pie plates, and Tons more! ♥ I receive no monetary compensation for this review. I was provided Louisville Stoneware to try and give my honest opinion.